This is your guide to life with a 9 week old puppy. 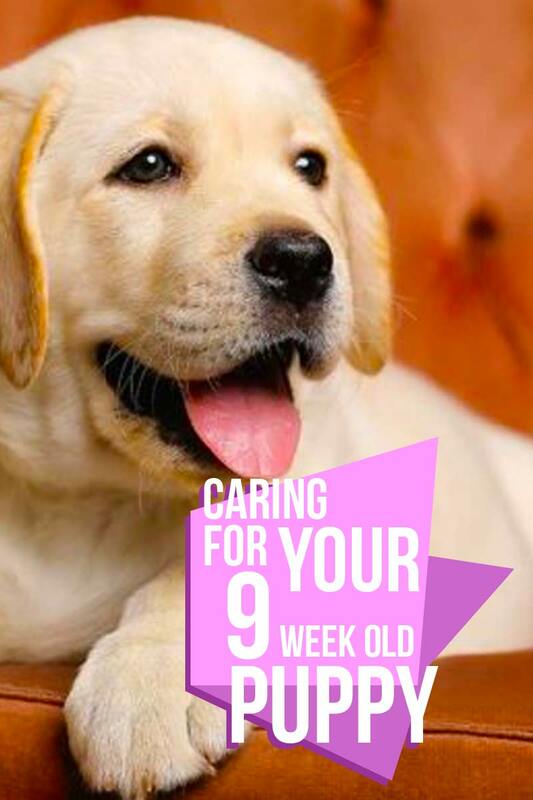 We’ll show you what to expect from your puppy at this age, and you can check out our 9 week old Labrador puppy video. You’ll also find a 9 week old puppy schedule and lots of great tips for your 9 week old Lab. At nine weeks old, most Labrador puppies are just settling in to their new homes. If you have a 9 week old, you’ve probably had your little one home for a week or so. And his initial reserve, if he had any, will have worn off. This a point at which new owners often have a lot of questions. We’ll take a look at them one by one. How much should a 9 week old puppy sleep? Some people worry that their puppy is not sleeping enough – or that he is sleeping too much! Most puppies are still sleeping a lot at this age. Eighteen to twenty hours a day is not unusual. 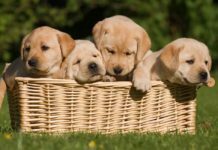 Puppies don’t normally need to be shut away to have a nap, they’ll drop off to sleep quite happily in a basket or crate while family life goes on all around them. 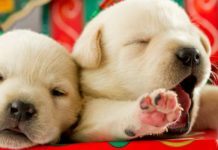 There are situations however, where you may need to help your puppy sleep. If you have young children for example, or another young dog, you may have to step in from time to time, to make sure your puppy can nap when he needs to. When will my puppy sleep through the night? Sleep is very precious, and however adorable your little chap is, you probably don’t want to play with him at 3am. Some puppies are starting to sleep through the night at 9 weeks, at least from midnight to around 6am, which I do appreciate is still night time to some of you. However, some pups are not quite there yet. Hang on in there, it will come. Probably in the next few days. You can help by keeping night time trips to the garden very brief, and very businesslike. No playing, no chatting, keep the lights dimmed. Out, wee, back to bed. Remember, some pups won’t quite manage six hours yet so you might be better off going to bed a bit earlier and getting up at 2 or 3 am. Notice that we don’t feed puppies as soon as we get up, as may encourage earlier and earlier waking! Also the last meal of the day is several hours before bed time. How much should my 9 week old puppy weigh? Your best guide to whether or not your puppy is growing properly is how he behaves and feels, rather than what the scales say. As a rough guide, many 9 week old lab puppies will weigh between 18-20lbs or a couple of pounds either side of this. 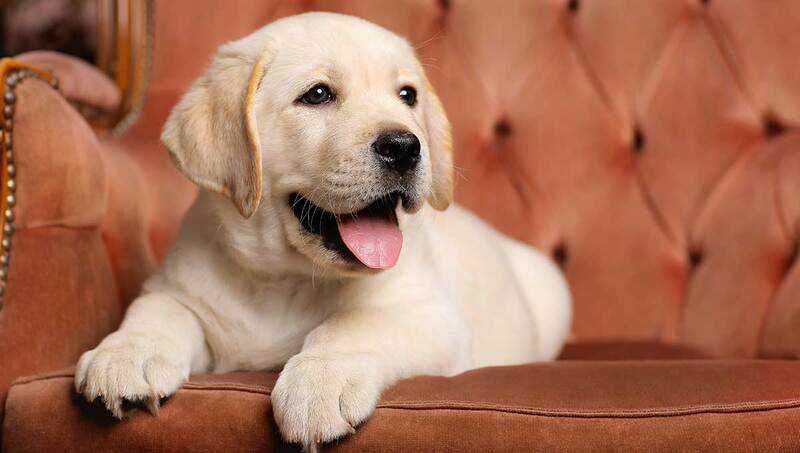 Puppy weights may also vary quite considerably between the two different types of Labrador (field and show) and even between individuals from the same litter. Nine weeks is often the point at which people start to worry about potty training progress, or rather, lack of it. Perhaps you are taking your Labrador puppy outside after every meal, and every time he wakes up, but he is still making puddles all over the house. Nine week old pups have very poor bladder control, and short memories. He is still very much a baby and will need your help in this department for some time to come. You role is to restrict his access to areas where mistakes are most likely to happen, through the use of baby gates or some other kind of temporary barrier. You will also need to take him outside before his bladder is over flowing (which might be every twenty minutes at certain times of the day) and to generally ensure that every wee goes in the right place. Another common question at this age is about puppy aggression. This is such a common concern, and often arises for the first time at about nine weeks. The puppy is settled in his new home, his shyness has worn off, his confidence is back, and he is ready for some fun. Concerns arise, simply because most people do not realise just how ferocious Labrador puppies seem when they play. 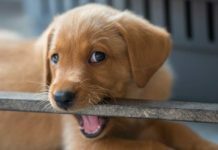 Check out this article on puppy aggression to reassure yourself that you have not bought a vicious wild animal into your home. Many puppies, especially Lab puppies, are very greedy and wolf down every morsel you provide for them. Each puppy will need feeding according to his or her size, and as we’ve seen, sizes can vary widely even in the same breed. So it’s important that you start by following the instructions on the packet. 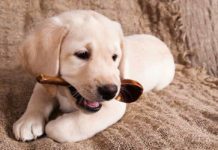 You can then add a little more to each meal if the puppy is not gaining weight steadily, or reduce the meals a tiny bit if he is getting too plump. Some puppies are quite picky, and won’t always finish a meal, but that’s fine. However, if your puppy normally eats heartily and suddenly goes off his food, all food, then he may be unwell. Have a chat with your vet if you are concerned, especially if your puppy misses more than one meal. On the other hand, if he is quite happy to eat an alternative menu, the chances are he is simply exercising his right to an opinion. I strongly recommend you ignore this, and simply take his bowl away. 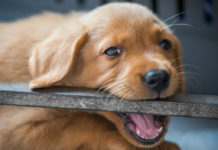 You can offer the same meal later when the puppy is more hungry. 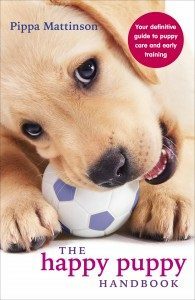 It’s never too soon to start training your puppy provided that the training is age appropriate. And provided that you use modern methods, which are great fun for dogs of all ages. Puppies this age often object to wearing a collar and lead, so you need to be patient. Fortunately this is not a problem at all, because a nine week old puppy does not need a walk. In fact, he won’t need a walk in any formal sense for several months. What he needs is space to trot about and play. And your yard or garden is probably suitable for this. In addition, you can’t yet put your puppy down on the ground outside your home, because he is not fully immunized. So, you have all the time in the world, in which to introduce your puppy to his collar and lead. Let him wear a collar for a short while each day. Clip the lead on from time to time and let it trail. Distract him with food and cuddles. Occasionally pick up the end and encourage him to follow you. Make it ‘no big deal’ and he will too. You might also want to consider getting your puppy a body harness, he’ll need one in any case once training starts in earnest. And it’s a good idea to have your puppy wear a harness once he starts being socialized from ground level. We have known for several decades that puppies need to be exposed to different types of experiences before they are three months old, in order to become confident and fearless. Yet far too many puppies are kept at home, away from the world in those important first few weeks. Don’t let that happen to your puppy. Socialization is all about raising a friendly confident dog, and proper socialization helps to avoid problems like fearfulness and aggression. And if it hasn’t started already, that process needs to start right now, at 9 weeks old. That means taking your puppy to lots of different places, carrying them in your arms or a carrier, to avoid contact with potential sources of infection. Enrolling your puppy in a well-supervised, modern force free training class can be a great way of building social confidence too. Studies have shown that puppies enrolled in classes before 20 weeks of age are less likely to be fearful than puppies kept at home. Can I bathe my 9 week old puppy? Most puppies don’t need to be bathed unless they roll in something unpleasant or get themselves covered in food. But Labradors being Labradors, there is bound to come a point when you have a sticky or messy pup on your hands! Fortunately it’s fine to give a 9 week old puppy a bath occasionally. Just use a gentle shampoo designed for puppies, and try to make the process fun for your little one. You might find the kitchen sink or a large plastic bowl is a lot less scary than the great big family bathtub. 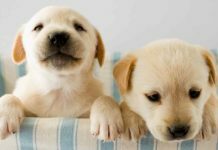 Caring for your 9 week old puppy – A guide to looking after your puppy from The Labrador Site. Do you have a 9 week old puppy? Let us know what your concerns are, and share your tips with other readers. And don’t forget to have fun, this stage passes all too quickly, and he will soon be too big to sit on your lap and carry around in your arms! 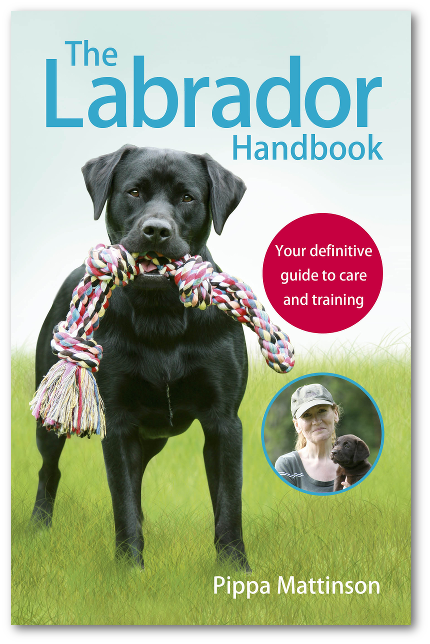 Check out our Labrador Puppies section for more help and advice on surviving the early days of puppyhood. When Can Puppies Go Outside: Is It Safe To Take Your Puppy Out? I am a little concerned about my 9 week old lab! She does not weigh what she should (she only weighs 5kg), you cant see her ribs, and shes a very fussy eater. We feed her 3x a day on Arden Graange kibble. She eats a little and then is not interested. But she will eat a little more from the hand but it takes a long time. I have tried adding scrambled egg, water + gravy and she eats a little more by herself but then leaves it. I’m not sure what to do???? I don’t want to hand feed much linger because that could cause all sorts of issues. She does not get a lot of treats and if she does its her kibble for training. Look and feel are good measures too, and the above article will help you to asses her. However, every dog is different and if you are concerned it’s a good idea to have her checked over. Have you taken her to the vet? They really are the best person to assess your puppy. Hi all! I have a 10 week old chocolate lab pup that HATES being in his crate. Anytime he is in his crate he constantly barks/whines and poops in his crate on occasion. When we first got him we attempted to crate him at night, and we did so for over a week. Recently we’ve given in to crating him at night due to the constant whining and barking (when I say constant, I mean 6+ straight hours) any pointers to help with the anxiety he’s having while in his crate? Hallo! I have a 9 weeks puppy who weights now 8 kg. Is that too much? She never eat 4 times a day. The fourth meal she never wanted. How much food I should give her? I have been told to give her 350 g a day. Then I have another question which is not related to the eating habits. What should I do if my dog refuses to walk? Sometimes she just lying on the ground and she is not coming to me no matter what I do. Regarding her not coming to you, it is impossible to say without seeing the context. Have a chat to your vet if you are concerned that there may be a health issue. Is this website still active? As I see no response from you to questions and concerns from people that have left messages to you in 2015?? If by active you mean do we look after the website, publish new articles, and update old ones, then yes – the website is very active indeed. We don’t answer every comment posted, though we would love to, simply because there are over a thousand pages on this site, and it isn’t physically possible for us to look at all the pages each day and answer all the new comments. We do our best though, but if you need help with your dog or puppy and your comment does not get a response, the best thing to do, is to join the forum where there is help, and support given freely, just as it is here. Do you have a problem with your 9 week old puppy? i have a 9 week old lab puppy i was curious how much i should be feeding him. I want to feed him twice a day how much should a serving be? Is it normal for my black lab to not really want to play much? Hes 8 1/2 weeks old and he just sleeps alot amd cuddles with me on the couch. He plays with my little ones very little. I got my pup when he was six weeks old. After a rough few first nights of crate training he is sleeping through the night! He has been sleeping through the night since the first week. DO NOT give in to the whining unless it lasts more than 30 min. He is going in the crate when I’m at work and at the gym as well. Sometimes when I open the door he just looks at me. He doesn’t want to come out. He loves it and is already spoiled rotten. He has been a dream! Will letting my puppy take less and shorter naps help him sleep better at night instead of wanting to play after every late night potty break or will it be bad for him to get less daytime sleep? He thinks he’s nocturnal right now, happy to sleep all day and wanting to play all night. I got my puppy when he was 8 weeks. He was taken away from his mother around 6 weeks to be weaned. So I’m guessing, my puppy never learned to play nicely or even “bite inhibition”. I’ve had him for three weeks and he’s quite mouthy. His main target is definitely our fingers and hand. I don’t know if he’s purposely being mean or so, but let’s just say his bites aren’t too nice. What can I do to stop him from biting? We’ve tried doing the yelping and loud screams to startle him and ignore him, but it doesn’t help. Hi. I love all the comments. We are not alone with the puppy concerns. Our lil guy is 8 weeks and he’s getting pretty wild. Every day he gets a bit more wild and nips a little harder. It will get worse before better. I am on my second Lab. It does seem like a lot of work but will get better eventually. We are starting puppy classes to socialize him and to teach him how to walk with a leash. It’s a 4 week class and I rec doing it. Once you are around all the other pups you won’t feel alone. Lol. Did your pup grow out of this? Cause I’m having the same problem with my 9 week old lab and the yelping and ignoring don’t seem to be making any difference.. Trying to train my 9 weeks old pup to go to the toilet outside and not in the house or crate but she’s refusing in the cold weather.what should I do?? We have a 9 week old puppy who is doing great with potty training and is starting to sleep better at night (about 6 hours). The issues we are having (which may be connected) are that she nips a lot, especially with my children (age 20 months-9 year, and there are 5 of them). Because of how active our kids are, Lucy (the 9 wk old black lab) is struggling to take naps. How often and for how long should she nap, and should they be in her crate or can we have her out on her blanket in the living room? I am wondering if her not getting enough sleep is making the nipping more of an issue than it should be. Brendan you’re going to have to either have a dog walker come to take him out at lunch time, or consider doggie daycare. 10 hours a day is a very, very long time for a dog to be alone. I’d even be inclined to suggest you get a cat instead. I work 10hrs a day and am concerned about my 9week old pup not being taken out to pee during that time. What should I do? The agreessivess and won’t walk on lead is true for our puppy. He was very gentle the first week we got him but is now wanting to everyone and everything. Thankfully, he likes his crate so leaving him in there with lots of chew toys gets a bit of the aggression out and he is ready to play normally. The lead – he hates it. The first week we had left him in the fenced backyard, so now not having a free rein to run around wasn’t to his liking. We have let it go for now. He starts puppy socialisation classes next week, we are hoping we will get some pointers there on how to walk him. Our problem is actually that he is underweight. Our vet thinks he is healthy. He likes his food, he eats it as much as he wants which is about half a cup 3 times a day, sometimes a bit less, sometimes a bit more. But he just weighs 3 kgs! 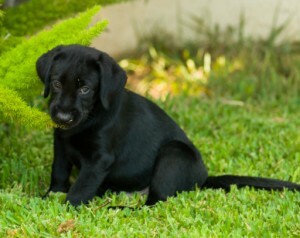 I heard that the average for a 8-9 week lab puppy is somewhere between 10-17 lbs, he is just 6 lbs! I forgot to ask, how much water should I place with the Lab and Jack Russell while I’m at work? I can come home at lunch time each day which will be about 5 hours after I first get to work. Thanks again, it’s great to have you guys around to get answers from. I will be picking up my new lab at 6 weeks old and also a Jack Russell terrier at 7 months old to be companions this coming Sunday. I have been visiting with both dogs twice a week for some time now. They both have great dispositions. My questtion is this, I plan on putting them both tegether in the hallway of my house, (blocked off of course), while I’m at work. I know there will be messes when I get home, but when I get home, I will crate train and train them to go outside. Do you think they will both be ok? At 7 months old, will the Jack Russell have tendencies to harm the younger lab? Thanks very much. Hi I was wondering when can I put my 9 week old yellow lab in the water how old should they be when they are introduced to it? Also my lab usually gobbled down his entire bowl the first few days yet now he only eats half of his bowl or even a quarter, Should i be concerned? Hi, We have had our black baby a week and are totally in love with her. We need to secure her when she outgrows the puppy pen, on the 2 days I work. We had thought of over head wire between two posts and a thing like they have on flying foxes, attached to a chain on her harness. But is this safe for labs? I don’t want her hurt. We thought of an enclosed pen, but what to do for a floor? We are in Australia and the cement might get hot. Hi Anne-Marie, what you describe is a ‘running tether’ and is not suitable for dogs that are not under supervision, or for use over an extended period of time. It is sometimes used by trainers that have multiple young dogs out on a training session, simply to restrain those not under instruction. Please don’t do this to your puppy. The best way to keep a young dog safe whilst you are out of the house, is with a dog crate. This should be located indoors, not outside where temperature changes may be extreme. You will need to arrange for someone to let her out every two to three hours. The alternative is to build a proper outdoor kennel and run. In hot climates, the sleeping compartment must be suitably insulated so that the dog can keep cool, and the run must be shaded. How much training should I be concerned with at 8/9 weeks? Crate and toilet training are obviously the priority but what is best advice for when to start obedience training? I just received a 10-11 week old lab as a birthday present from my mom. This site has answered so many questions we have had the past few days. Hi! We are just over a week of having a new Christmas lab puppy – he’s right at 9 weeks. He’s adjusting very well and your web site has been very helpful. Question – he’s eating rocks. And leaves. And sticks. And grass. And weeds. How can I let him romp around my backyard if he’s ingesting non-food items? How do I get him to stop? Our puppy is 9 weeks today and has the same interests as Hannah’s! Any ideas? Thank you. We just got a female puppy which is 9 wks old now. We also have an almost 5 year old female lab. What information is there about incorporating a puppy into a home with an older established lab. I know they will assume their individual roles but I don’t want the puppy to dominate my older dog. We’ve had her since she was a puppy also.